A Puukko is a traditional Finnish knife design that goes back at least a thousand years to the Vikings and early Scandinavian countries. This utility knife from Benchmade may be what you’re looking for in a do-it-all belt knife. You can’t beat a classic knife design, IMO, because the research and development work has already been done for you. The Bowie, Nessmuk, Kephart, Puukko, Mora etc. knives were designed for specific purposes, and all you have to do is see if they will meet your needs. That makes knife selection easy, and reduces shopping. But that’s no fun, and not satisfying to diehard cutlery enthusiasts. And it doesn’t address the heritage issue. A knife enthusiast may want the same kind of knife a long-ago ancestor may have used. The Benchmade Puukko is a hardworking utility knife with a great handle. The puukko design comes from the arctic and the indigenous Sami people, according to thetruthabout knives.com, who used several knives for day to day tasks; the puukko was the smaller option, used to skin fish or animals. Records show the puukko dates back about 1,000 years. Both men and women carried puukkos, although the sizes change depending on the person. The historic design is just one reason I like the Finnish Puukko-style knives. The other is that the knife design just flat-out works. The field test started in the kitchen. The puukko is a good knife for food processing, but the blade is too short and thick to make it the best choice for cutting vegetables, fruit or cheese. The knife will work fine for cleaning fish, but you want a specialized knife for filleting a lot of fish. The puukko will work fine in the camp kitchen, but there are better choices. I used the Benchmade to do some skinning on a deer, and it was a good choice for some of the fine work around the neck and shoulders. It worked well, using a variety of grips. 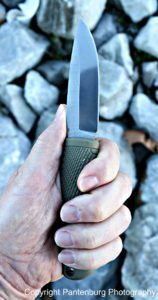 It could be a good deer hunting knife, but personally I want a longer blade, as is on the Bark River Bravo 1.25 or the Ambush Tundra. This deer season, I used a BR Fox River EXT-2, with CPM 3V steel, to gut, skin, quarter, disjoint the lower legs and cut off the head of a whitetail doe. When I was finished, the knife was still razor sharp, and was used without any touchup to carve the Thanksgiving turkey. This puukko is holding an edge really well, despite all the hard work it gets used for. Blade thickness: A puukko doesn’t need a thick blade. In fact, a thick blade on a knife of this design would be a waste of steel, weight and utility. This would not be the knife you’d choose as a pry bar, but you should use the right tool for the job anyway! With a thickness of .80 inches, the blade is about right for a knife of this design. Related: What is the best camera for point-and-shoot outdoor use? Full tang blade: The strongest knife is one with a full tang that goes completely through the handle. The puukko’s full tang is another reason this knife is bulletproof. It would take serious, deliberate abuse to break it. I suppose it could be hammered into a tree, and stood upon, as some reviewers do, but what’s the point? Grind: The flat grind with micro bevel is a good choice for the Puukko. It is easy to sharpen and it slices and whittles quite well. If the knife is regularly stropped on a leather strop with compound, it will eventually be worn into a convex grind. This is a good thing, IMO, since convex is my favorite grind! Handle: Made of Textured Ranger Green Santoprene, the handle is long enough for those of us with big hands. But the diameter and handle size also works really well for people with smaller hands. I didn’t notice hot spots after whittling for a while, and I don’t think any would develop over extended use. The handle stays safe and secure, even when wet, or when it is being used while wearing cut resistant and/or latex gloves. Point: It’s hard to beat a drop point for overall use. The puukko’s point would make it a fine choice for the first under the tail work of field dressing a big game animal. It would also work well for the initial, spine-down, edge-up cut that opens up the abdominal cavity of an animal. Sheath: The sturdy leather sheath is set up as a dangler, and it is very comfortable to wear. Handling: Puukkos handle well, because the design has been refined over generations of users. It works well when working inside the abdominal cavity of a big game animal, and it feels nimble in the hand. Do you need a Benchmade Puukko? If you are looking for a user knife that can take a lot of use and abuse, you can’t go wrong with a puukko design. I like this knife a lot, and it will be getting a lot of use. Ark Extinction – The Perfect Owl Trap!! !